I know, there has been quite a lot of cheesecake recipes lately, however, it’s to be expected since this is my favourite dessert. If you are in the mood for something else, just check out the vegan dessert section. So lets get down to this small but oh-so-delicious treat that I made. 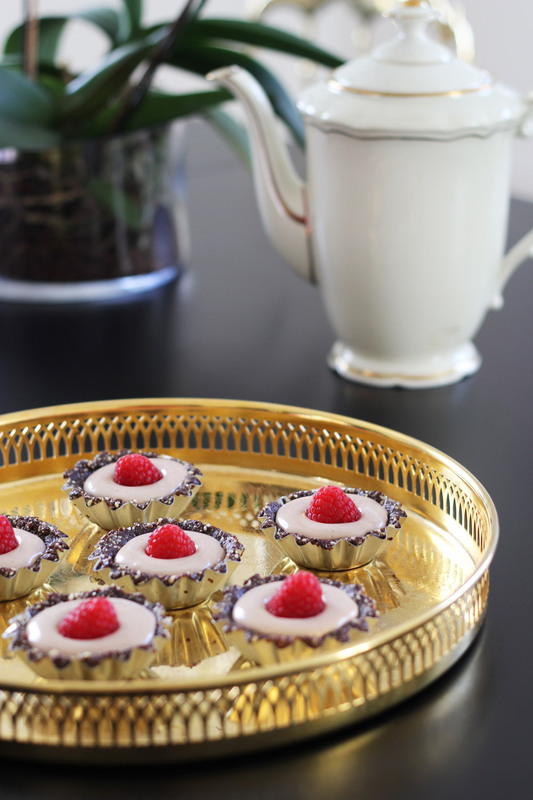 It’s a creamy and fluffy coconut cream centre with a toffee-like taste crust, that is pure perfection in your mouth paired with the fresh raspberries. 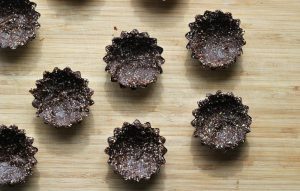 I created this since I wanted something small, bite sized and something that I could have as a dessert in the evening as I get very jacked on raw cacao (!) and can not sleep from it. For the crust, I used a small steel form that is commonly used in Sweden for making a small cake called mazarine, they have approx 3-4 cm in radius and come in two different shapes. Mix all the ingredients for the base in a food processor until as evenly and smooth as possible. Add more nuts if the mixture is too wet from the dates. The drier the better. Since the filling will make the base quite moist. The base should be a finely milled crumble. When you press and form it, it should stock together. Scrape out the dough from the food processor, add small balls into each form, press out the base into each form and make an indent in the middle. Add to the fridge and let cool of and set, preferably overnight. to ensure the best result. Blend the ingredients for the filling in a food processor and blend for appox. 5 minutes until everything is evenly mixed. Add the filling to each dish and decorate your cheesecakes with fresh berries and other yummy and beautiful things. Place in the fridge. Let stand overnight to set.